For every celebrated work of art there is surely someone willing to steal it. Most of us remain obediently behind the velvet ropes that keep us from edging too close to a museum’s Manet or Monet, but then there are those who elude alarm systems or subdue security guards and slit prized canvases from their frames. The thieves vanish with the dawn, or perhaps even stroll off in broad daylight, while the art itself enters a mysterious purgatory from which it may or may not ever emerge. 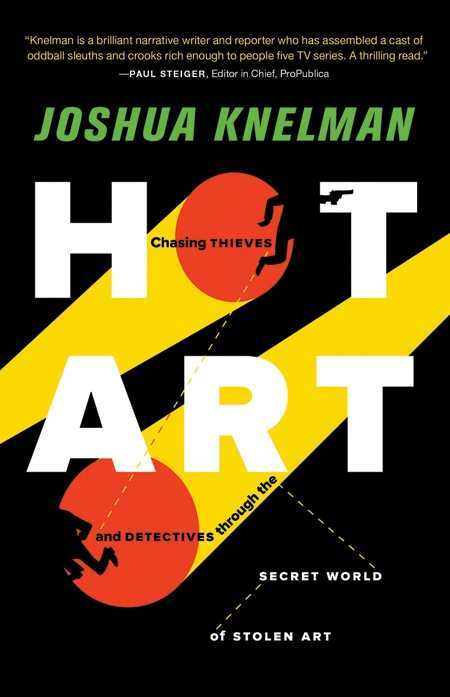 Canadian journalist Joshua Knelman’s Hot Art is a work of nonfiction, and compared to the literary or cinematic realm of art theft and thieves, the truth is grittier, quirkier, and far more interesting. From interviews with a wily criminal to ride-alongs with detectives chasing down leads to the savvy of art-theft attorneys, FBI agents, and insurance experts, Knelman’s page-turner reveals how art crimes are generally fueled by one factor: the greed of collectors. Those who help track down the plunder and plunderers tend to be self-taught, learning through experience and their own instincts while dealing with erratic informants and occasionally nebulous gallery owners. A Rembrandt lifted from the Dulwich Picture Gallery in London resulted in tense negotiations before its return, with hostage-like Polaroids of the painting being held in a filthy bathroom causing further emotional distress. And then there was the seemingly hapless man who purchased stolen portraits by Sir Joshua Reynolds and Thomas Gainsborough at a British flea market and ended up being arrested. A shrewd lawyer, however, came to the rescue with a centuries-old law allowing that any item bought at an open-air market “between sunrise and sunset” belonged rightly to the buyer, even if stolen. (The law has since been repealed by Parliament’s House of Lords.) Hot Art also explores private heists, including a 2008 robbery wherein thieves walked through an unlocked door at a California home and stole millions of dollars worth of works by Marc Chagall, Diego Rivera, and Arshile Gorky. The advent of the Internet and instantaneous global communication has made life a bit tougher for art and antiquities thieves and their accomplices, but many cases remain unsolved. One haunting loss occurred at Boston’s Isabella Stewart Gardner Museum, where Knelman notes how an empty frame still marks the 1990 disappearance of Johannes Vermeer’s The Concert—a poignant memorial of what once was, and what has never been publicly seen again.